Success of the energy turnaround will depend decisively on the extended use of renewable energy sources. However, their efficiency partly is much smaller than that of conventional energy sources. The efficiency of commercially available photovoltaic cells, for instance, is about 20%. 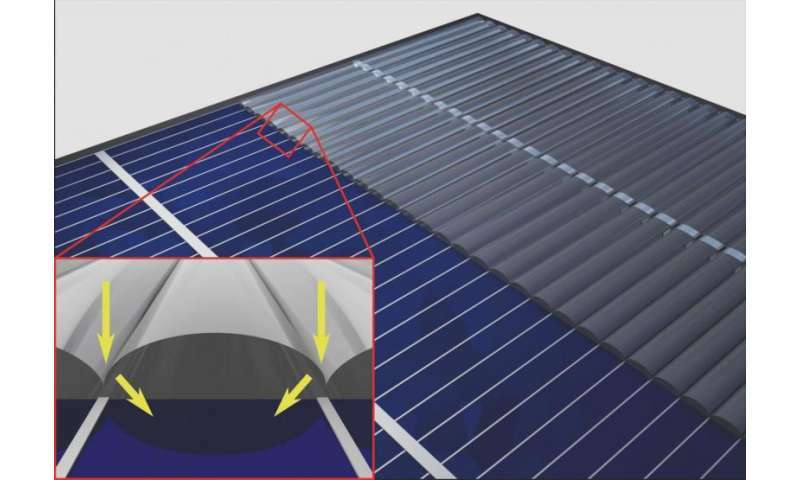 Scientists of Karlsruhe Institute of Technology (KIT) have now published an unconventional approach to increasing the efficiency of the panels. Optical invisibility cloaks guide sunlight around objects that cast a shadow on the solar panel, such as contacts for current extraction. "Our model experiments have shown that the cloak layer makes the contact fingers nearly completely invisible," doctoral student Martin Schumann of the KIT Institute of Applied Physics says, who conducted the experiments and simulations. Physicists of KIT around project head Carsten Rockstuhl, together with partners from Aachen, Freiburg, Halle, Jena, and Jülich, modified the optical invisibility cloak designed at KIT for guiding the incident light around the contact fingers of the solar cell. By means of a model experiment and detailed simulations, the researchers demonstrated that both concepts are suited for hiding the contact fingers. In the next step, it is planned to apply the cloaking layer onto a solar cell in order to determine the efficiency increase. The physicists are optimistic that efficiency will be improved by the cloak under real conditions: "When applying such a coating onto a real solar cell, optical losses via the contact fingers are supposed to be reduced and efficiency is assumed to be increased by up to 10%," Martin Schumann says. Also, would dust build-up in the grooves? Would these be easier or harder to clean? There will be no added structure, solar cells cannot be used "naked" (but in space), are always covered with an extra transparent, glass or plastic, layer. Just need to shape this layer in a "invisibility cloak" shape. And, in order to avoid dust buildup, the "grooves" could be filled with a material with a different refractive index, or the lenses layer could be reversed, with the grooves on the solar cell side.